Darkness is my attempt at a biocentric reading of Joseph Conrad’s Heart of Darkness (first published in 1899), a re-working in which all traces of “the human” are erased. 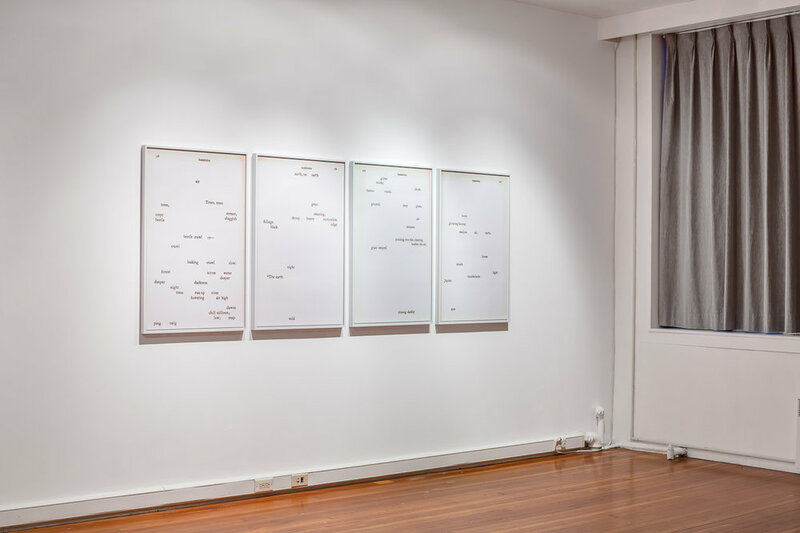 By “whiting out” man and grammatically foregrounding “nature,” the project aims to activate the backdrop or scenery upon which this story of colonial horror unfolds, and in so doing to attend to the latent narratives of any organic, non-human remains. In an effort to disrupt the “portrait” orientation of the page, these pieces (culled from the Signet Classic) are hung as a tetraptych, suggesting a “landscape” reading of the work. In this way the remaining words endeavor to exceed the frame of the page, inviting the viewer/reader to participate in the theater of the biocentric text. The project’s failure to fulfill its promise of an articulated, pre-human wilderness is precisely its point; there is no other, and no Eden without Eve, only an endlessly precarious entanglement.